As the days are getting a little longer and brighter and the flowers are starting to bloom, spring is somewhat in the air. However, the comfort you get from a hearty Sunday roast is still much needed on those grey winters days- and even better if you don’t have to cook it yourself. 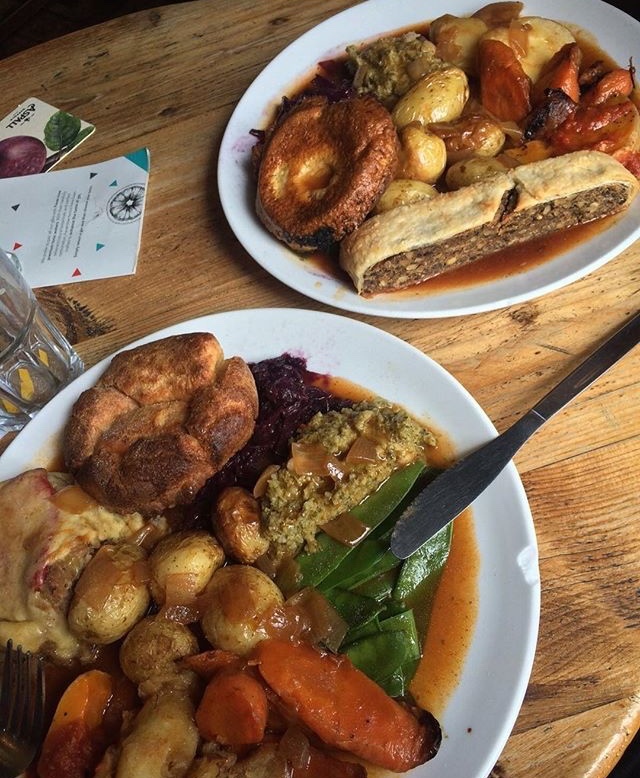 Here are my suggestions on where to find the best vegan/vegetarian pub roasts in Brighton! The Roundhill, based a little bit out of the centre on Ditchling Road, re-opened only last November as a result of the vision of a young couple to provide good booze, a homely atmosphere and a fully vegan/veggie menu that moves away from your classic veggie pub food affair. Think ramen, vegan lasagne and spicy cauliflower wings. They even have locally made vegan doughnuts and croissants available! However, their Sunday roast is the real show stopper and best of all, they really do take their vegan option seriously. They haven’t just replaced a hunk of meat with a few Linda McCartney sausages, but instead offer veganized versions of all your favourite trimmings. With a cauliflower cheese that’s crispy on the top and a Yorkshire pudding to mop up your gravy, the Roundhill really impressed me with their dedication to making sure us herbivores don’t miss out. My dad always tells me that when he was vegetarian in his twenties, he went for a roast at his then-girlfriend’s house and instead of the meat, was provided with a spoonful of baked beans – he didn’t stay vegetarian for very long strangely enough. Thankfully, gone are those days as the Roundhill provides the choice of a nut roast, root vegetable gratin or a stuffed courgette. Their roast dinner is amazing overall, and you definitely don’t feel like you’re missing out on the good stuff as they cater so well for those who don’t want the usual animal-based trimmings. The Prince George @ 5 Trafalgar Street, BN1 4EQ. The Prince George was recommended to me by a meat eater a while back, and I think that says a lot about the sheer greatness of their roast. Situated in the North Laines, this pub also has a fully veggie/vegan kitchen with a solid menu throughout the week but come Sunday, they really pull out all the stops. It’s a choice between a mushroom, cashew and tarragon wellington or a leek, cheddar and red pepper nut roast, but for me the trimmings are really what make it. 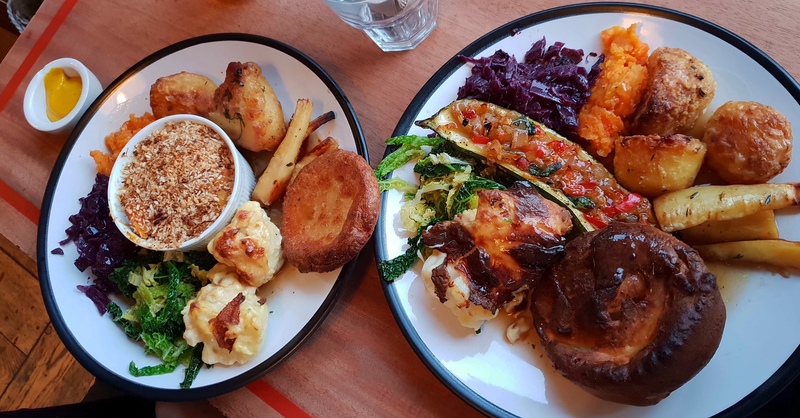 It’s not your usual boiled veg affair – think roasted carrots and parsnips, braised red cabbage, a herby stuffing and roast new potatoes, however unlike the Roundhill, they can’t offer you a vegan Yorkshire pudding! What they don’t provide for in terms of Yorkshire puddings, they make up for in portion size because you most definitely won’t leave the Prince George hungry! In fact, I’ve never yet been able to leave a clean plate there and I’m a real greedy (vegan) pig. Most importantly to me, they’re not stingy with the gravy because after all, that really is a make or break because there’s few things worse than a dry roastie. We had to ask for extra gravy at the Roundhill, so maybe the Prince George has a slight upper hand in that department. Head on down to The Prince George if you need a stomach bursting at the seams with pure comfort cooking, and with lots of gravy to boot!